Harbin, the capital of Heilongjiang Province and the largest city in China’s north-eastern region, is a unique and exciting destination in which to teach English. During the 19th Century, Russia built the terminus of the Middle East Railway in Harbin, causing over 100,000 foreigners to migrate to the city. This influx of migrants encouraged the development of a capitalist economy, helping it experience unprecedented growth. 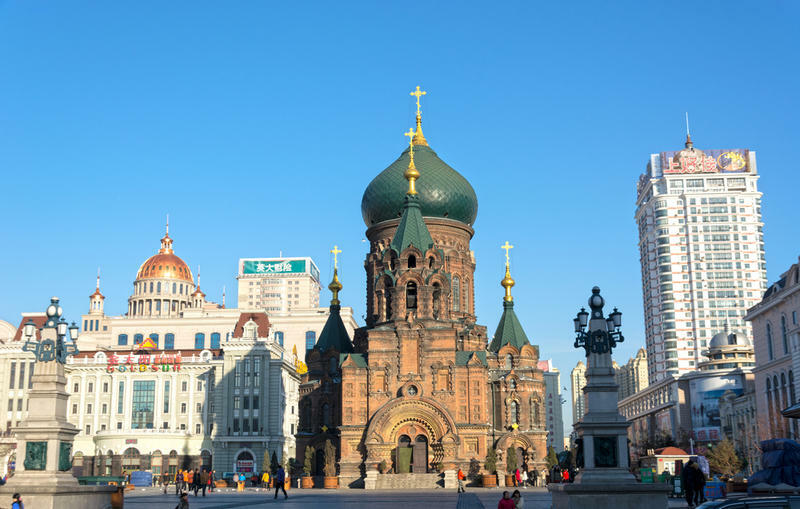 Harbin’s proximity to Russia gives it a unique feel; Sofia Cathedral and Central Street are built in a European style, almost tricking you into thinking you’re in Moscow! Harbin’s northern location means the city enjoys cool summers and endures bitterly cold winters. The city is best known for its most famous winter attraction; the Snow and Ice Festival. Teach in Harbin, and you’ll get to explore one of China’s most unique and mysterious cities. A teaching placement in Harbin will see you working with one of our longest standing private school partners. This organisation has branches across China, and has a well-established brand. As a private school teacher in Harbin, you’ll receive structured support and training before and during your contract. Classes consist of no more than 15 students, and you’ll get the chance to teach a range of age groups and abilities. High performing teachers will get the chance to progress to other roles within the business. Our Harbin teaching positions offer a net salary of up to 9,000 RMB per month, a very good salary for this region. The package also includes a TEFL, medical insurance, reimbursement of flight and visa fees, and regular teaching modules to help your progression. Salary level may differ depending on your experience. Our partner organisation offers all teachers in Harbin free accommodation within a shared apartment. Apartments are comfortable and equipped with all essential amenities and a western toilet. Should you wish to find your own accommodation, the school will help you do so, as well as provide an additional monthly living allowance to put towards the rent. Rental prices of apartments in Harbin range between 1,000 – 2,000 RMB per month, depending on location. This is optional, and all teachers will be offered free accommodation. As one of China’s most unique and mysterious cities, there is much to see and do in Harbin. Here you’ll find some of the best attractions in the Heilongjiang capital. Central Street: Arguably the city’s most unique place in terms of architecture, Central Street is the place to go to experience the ‘Moscow of the East’. 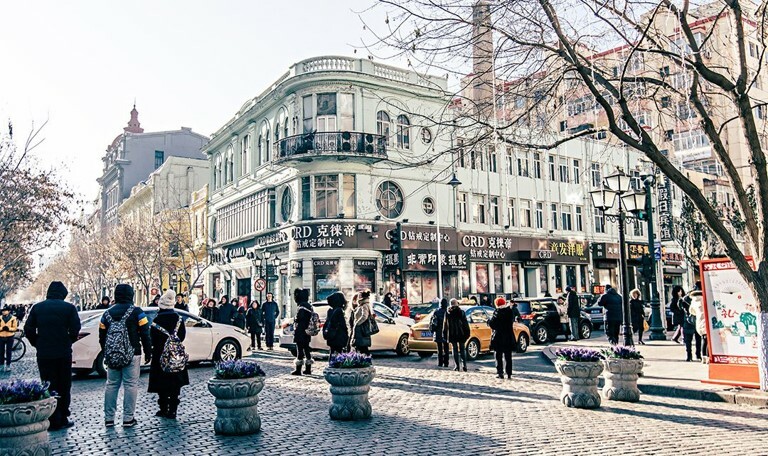 The street is lined with European-style buildings dating backs hundreds of years, giving you the sense you’ve stepped out of China and into Russia. St. Sophia Cathedral: As the largest Eastern Orthodox Church in the Far East, Saint Sophia Cathedral is an impressive sight that’s not to be missed. Built by Russians in the early 1900’s, the cathedral has been well maintained, and is greatly respected by the locals. Sun Island Scenic Area: This famous scenic spot is surrounded by blue water, crystal lakes, wooden rockeries, beautiful flowers and exotic buildings. It makes for a great place to visit during both summer and winter, and the perfect escape from the hustle and bustle of the city. Harbin Snow and Ice Festival: Each year, talented ice sculptors from around the world gather in Harbin to show off their artwork in an exquisite display and create the world’s largest ‘ice city’. The festival is formed of various parts, with visitors able to go ice skating, sledding and more. Though it’s not included in the Chinese Eight Cuisines, Harbin still boasts its own delicious specialties that are very different to the food of other regions. Harbin sausage: Inspired by a dish from Lithuania, Harbin sausage is a made from ground meat, such as pork, beef along with salt and spices. Different restaurants have different cooking methods, and it’s now a popular dish across the country. Braised pork: This is a staple in the diet of local Harbin people. Streaky pork is covered in a sauce made from dark soy sauce, sugar, salt, cinnamon and various other ingredients. It’s then put over a small fire and left to braise until tender. Guo Bao Rou: This is a form of sweet and sour pork, typical of north eastern Chinese cuisine, and widely recognised as Harbin’s signature dish. Made from sliced pork and potato starch, vinegar, sugar, soy sauce, garlic, onions, and oil, the dish is crunchy and tender, sweet and sour. Harbin is a very lively city with a rich entertainment scene. The city is home to many tea houses, KTV’s, bars, cinema’s and shopping centres that keep locals entertained. Guogeli Dajie is the place to go to experience the city’s nightlife. During winter, a great place to go is Yabuli Ski resort, where you can take part in a range of winter activities like skiing, sledding and ice sailing. For culture, head to Changchun Errenzhuan Theatre to watch one of the regions most famous performances whereby stories are told through music, dance and martial arts. Harbin Grand Culture Market is also a great place to go for folk performances, shopping and sightseeing. Interested in teaching English in Harbin? Check out our Private School Teaching Programme, or apply now to start your teaching adventure in this historical and unique city.